How to Send Blank Message in Whatsapp: May be you have seen that some peoples on Facebook who make “Blank” comments, yes Blank or empty comment. You must be shocked by seeing that kind of comments. Its too easy & rare & very less known trick which very less peoples know now. Like blank comment on Facebook, you can send blank messages on WhatsApp too with easy tricks. Yes you read that right, you can now send blank messages on WhatsApp to prank your friends. There is nothing impossible for android in any area of it, there are many tricks & tips for android and WhatsApp which can help you to make many impossible things possible with or without root. 2.4 #3 Send Blank Message in Whatsapp By Sending An Unidentified Character. 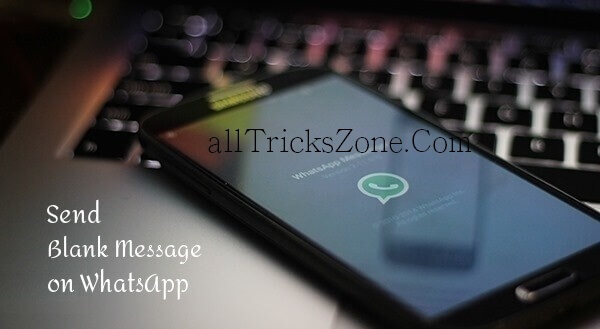 Sending blank messages on WhatsApp wasn’t possible before but it is possible now after reading this post because, we here at All Tricks Zone found a trick to send blank messages on WhatsApp to make your friends WoW,! 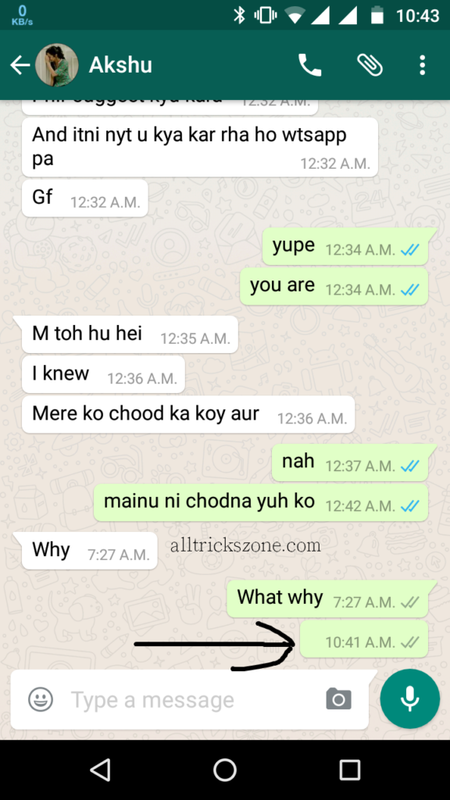 how did you send blank message on whatsapp. Your friend will believe on his eyes , this is the most amazing tricks which is very rare and less peoples known. Main Purpose of Sending Blank message in Whatsapp is just for Prank with Friends, and Make them confuse that how you are able to Send Them Blank Message? and he/ she can’t They will also try to type a Space and send you, but they will not be able to do so, because there is some different method, if you want to send blank message in whatsapp. We was also shared How to set Password on whatsapp for secure your whatsapp chat. So Read All Possible Ways for send blank message in Whatsapp now from below. Yahoo.! Friends Now You can send blank message on WhatsApp by following any of the method mentioned from below because, We have mentioned 3 Different methods step by step, for How can you send blank message in Whatsapp easily. As you know There are so many ways for sending blank message in whatsapp, but some of the best ways, for how to send blank message in Whatsapp, i will mention below in 3 Method. So Simply Checkout step by step guide on how to send blank message in whatsapp from below. 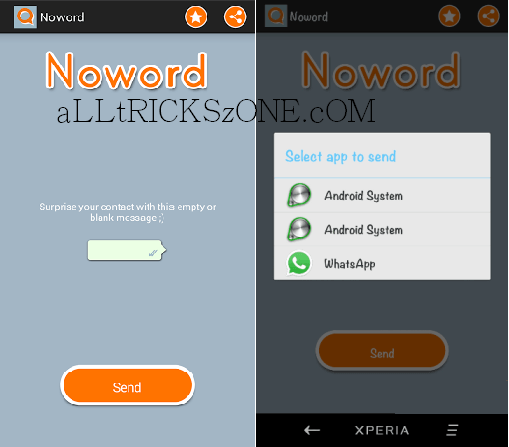 This is the most simplest method among all to send blank a message on WhatsApp because it’s done by MoWord.Apk App. In this method you need to download the below app to send blank message on WhatsApp, there are several apps available to this but we will suggest you the best. You can also use Whatsapp on your PC, with the help of Remix OS. Checkout How to Run Whatsapp in PC. First of all go to settings > security and enable the installation from unknown sources for install this Application, because it’s not available on Google Play Store. So we will install it from Apk. When you successful install the app, Simply open the app the from app drawer. After selecting WhatsApp now select any of your contact to which you want to send a blank message. Your Work is done now you’re successfully Sent blank message. Now it’s time to see the second method to send a blank message on WhatsApp to prank your friend. This method is totally based on PC trick, so you need PC / laptop for follow below method. Checkout easy steps from below to perform this easy steps. , then checkout this method. So Have a look at easy way for sending blank message in whatsapp from android from below. In your PC , open the notepad text editor. In the notepad text editor, either type ALT+255 or type ALT+0160. any one. Now after typing ALT+255/ ALT+0160 on your keyboard, there will be a blank space added to your notepad. Save the blank space on your computer, or press CTRL+C from your Keyboard to copy those space. Now You need to transfer above saved file to your android phone from your computer. You can transfer that file by using a data cable or any other method like Bluetooth WiFi. After transferring the BlankSpace.txt file to your android phone, open it by using any text viewer in Android, iPhone. Once you open the file in text viewer, Simply tap and hold on the blank space to copy the blank space. After That open your WhatsApp and select any contact whom you want to prank by sending a blank message. Now simply paste the copied content which you copied from that blankspace.txt file. Now click on send and send the message, you can also save it on your Android phone like Keep, note. Yeah.!! Now your friend will receive the completely blank message in their whatsapp message. This is second method by which you can send a blank message to your friend. Checkout Third Method about How to Send Blank Message in Whatsapp. Also See – Dual Whatsapp in Single Android. #3 Send Blank Message in Whatsapp By Sending An Unidentified Character. This is easy 3rd method by which you will be able to send blank empty messages to your WhatsApp contacts. There are many characters of different different languages which are unidentifiable by the WhatsApp. Since the character will not be identified by WhatsApp, it will show the blank message to the recipient. We was also shared some cool Whatsapp Tricks, check it out. This is the one of the easiest way ever for sending blank message in whatsapp. I am sure your Friends Getting Shocked When you will send him A blank Messages on whatsapp. Download unidentified characters from HERE. Open the file now, from your Phone via any text editor app in android or iPhone. Now paste this character on WhatsApp Friends. After deleting the quotes now send the message to any of your WhatsApp contact to prank them. and you are done, it will send blank message to your friends easily and your friend will be Shocked by Seeing this. So this is how you can you send blank messages on WhatsApp to prank your friends. Here We showed you three best and working methods by which you can send a blank message on WhatsApp. Keep sending this blank messages to your friends or any of your WhatsApp contact to prank them , I’m Sure they all will be amazed by seeing this kind of blank messages. As we said that this is a very rare trick and very less numbers of peoples know about trick so you can use this trick to become smart in front of your friends with some easy trick, let keep them asking the trick from you. Above all 3 methods are very easy and simple to use, and all these methods are 100 ℅ working …. I personally tested this methods and found all of them working On my iPhone & Android Too. Still if you face any kind of issue during using any of the above method then do comment below & feel free to ask us. We are always happy to help you. Enjoy Send blank message on Whatsapp trick from here. Also if you want any other trick to be posted here or want to share any great trick which you know then do share it with us, we will post it here. Keep visiting Alltrickszone to know awesome tips and tricks to Make your android device more smarter along with you. Thanks.